Are local fishermen an endangered species? 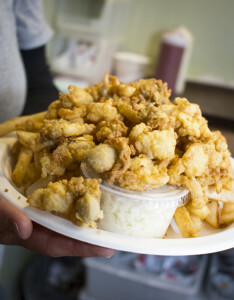 Al’s Seafood is mostly the fried variety served with French fries, but the clams are local. 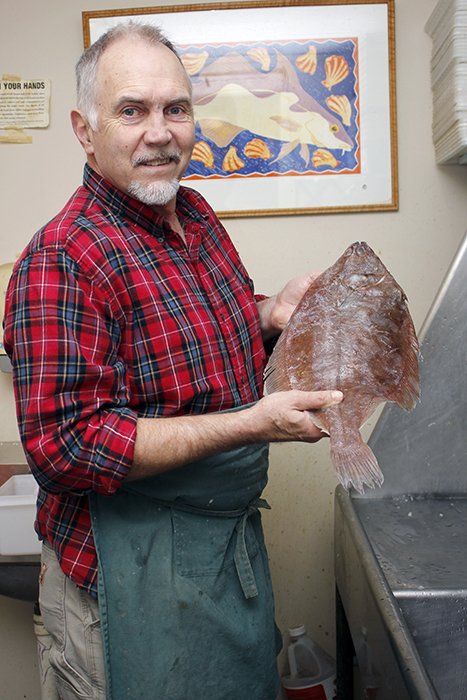 Fred Daley of Fresh Fish Daley in Exeter shows off a flounder. Most of his resources also come from the Boston fish markets. Seaport Fish in Rye has a vast variety of fish, mostly from the Boston fish markets. Portsmouth may be small, but there are a number of restaurants with a water view – and great seafood – tucked along the waterfront. 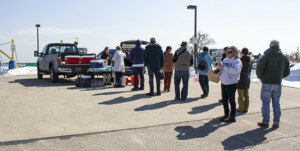 People line up to buy fresh scallops from Padi Anderson of Rimrack Fishing. 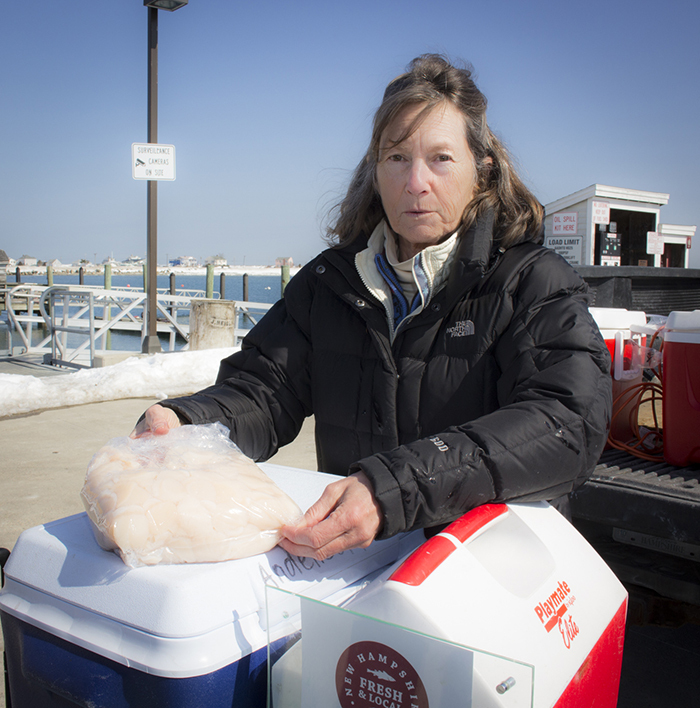 Padi Anderson of Rimrack Fishing selling their dayboat scallops on the Rye Harbor dock. 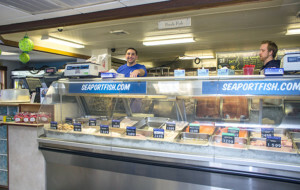 Rich Pettigrew of Seaport Fish in Rye in 2009 when the fleet of local fishing boats was very active. What happened? 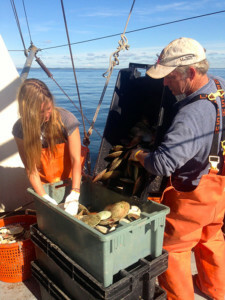 Five years ago, Atlantic cod — a historically important fish to New England — was in abundance off the coast of New Hampshire. Three hundred years ago, the sea was thick with them. The pilgrims survived once the Native Americans showed them how to fish, and eventually cod was exported and early Americans prospered. Fishing methods were improved, for greater efficiencies, but at a toll. For the last several years the toll has been drastic — not only is the cod fishery in peril, but so is the livelihood of small-boat fishermen. Cod catches have plummeted — down by thousands of tons. 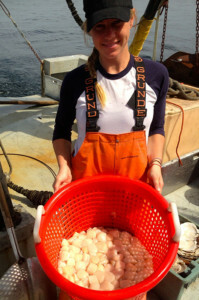 Spawning in the Gulf of Maine, where New Hampshire fishermen harvest the waters, is at an all-time low, just three to four percent of its target level. No one knows exactly why, but overfishing, warming waters and an increase in predators are cited as major factors. To stop the decline and rebuild the stock, regulators are imposing draconian restrictions on the size of the catch — restrictions that have commercial fishermen reeling. During the upcoming season, the New England Fishery Council says they must cut their cod catch by 75 percent — and that’s after a 77 percent reduction in 2013. Taken together, that means that this year the catch limit for cod fishery by commercial fishermen will be 207 metric tons instead of more than 3,700 in effect in 2012. 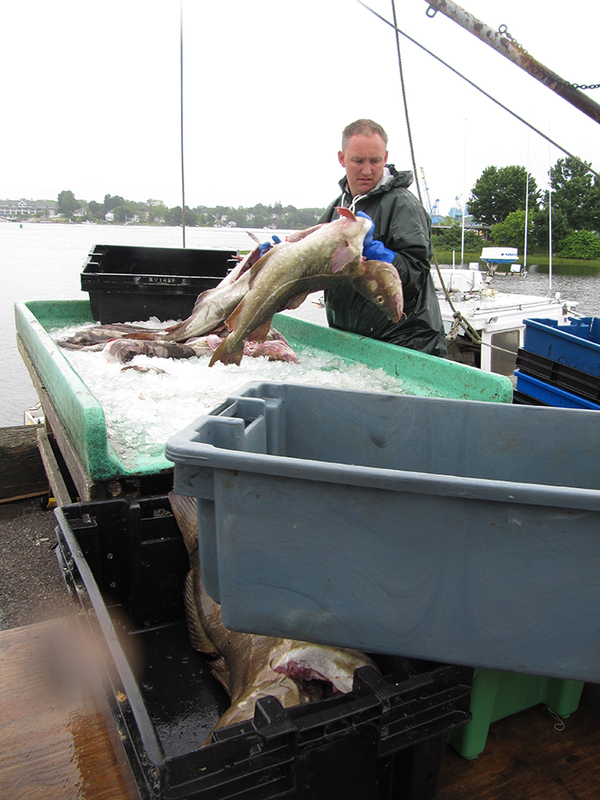 In addition to the severe cuts by the New England Fishery Management Council, this past winter NOAA Fisheries took emergency action to limit cod catches to 200 pounds per trip. That limit stays in effect until new regulations are put in place in May. 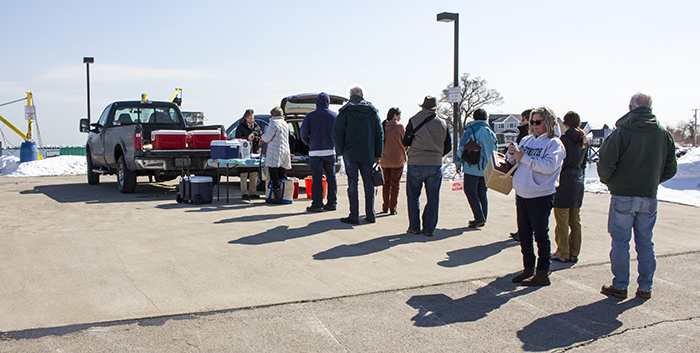 Federally contracted observers and NH Fish and Game personnel are on board boats and at landings to monitor the catch. Even the fishermen are policing each other because one violation can affect them all. Here’s why: Gill nets and trawl vessels are traditionally used to catch groundfish that school near the bottom of the sea. But now regulations say if cod caught in the nets with the abundant haddock, whiting and pollock pushes the fishing sector over the imposed limit for cod, that could shut down all groundfishing in their sector for the season. According to NOAA Fisheries, if you want to eat fish mindfully, here’s the latest scoop. 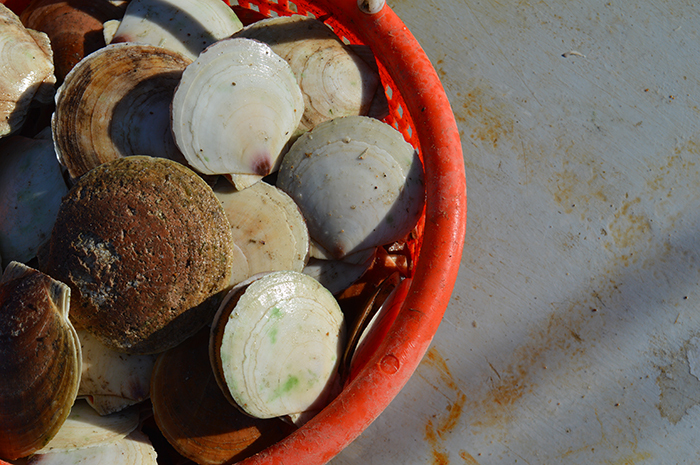 According to NH Fish and Game, there are 28 varieties of fish off the coast of New Hampshire. Party boats and recreational fishermen may be restricted this coming season. As a result, fisherman have had to set their sights and nets elsewhere, something that will not only significantly impact our traditional seafood choices, but also the livelihoods of fishermen, especially the small boat owners. The Andersons have had to learn a new dance to keep a cash flow going from fishing. Now, instead of groundfishing, they scallop during the winter months about eight miles off shore and bring in their haul to sell retail to word-of-mouth customers on the Rye docks. After April, they head to Massachusetts waters for squid fishing. Finally, they spend the summer in warmer waters. Padi feels, with so many fisherman coming up to retirement age, there will be nobody left who wants the permits that were so costly when they bought them. Their daughter, Kelsea, was practically raised on a fishing boat and is working on developing a documentary film called, “The Last Fisherman’s Daughter.” That’s a great title, but will it be the truth? “It’s a battle between local fishermen and regulators,” says Rich Pettigrew of Seaport Fish in Rye. “It’s almost impossible to fish for anything else.” Even if a lobsterman accidentally captures a cod in a lobster cage, it can spell trouble — monitors, observers or even other fishermen can report it and will add it to the latest catch limits. 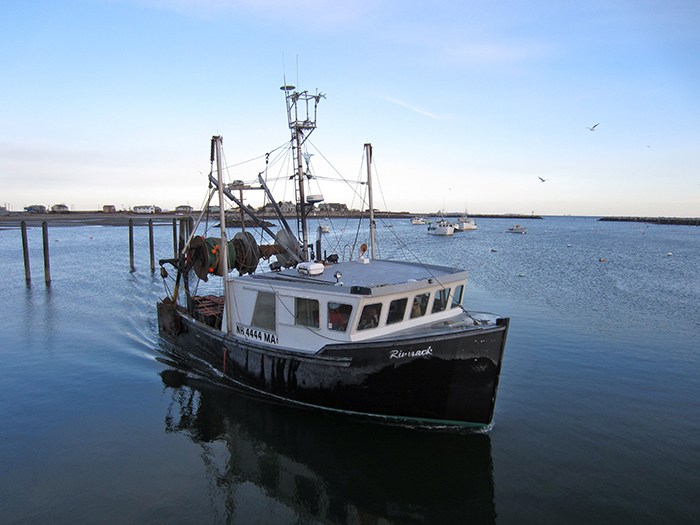 Steep fines can be devastating to fishermen and lobstermen. It was only several years ago that Pettigrew was down every mid-morning to buy fish from local fishermen at the docks near Peirce Island. There was a ton of cod and dogfish in their holds, gutted and cleaned as they traveled back to port. The dogfish were by-catch and boxed up with ice with the eventual destination of Britain to be enjoyed as fish and chips. Now the cod is gone, and only a handful of fishermen remain. Ironically, dogfish are in abundance, but with no local market they are not a profitable catch. Georges Bank, a viable but still-protected cod fishery, is about 45 miles out, but just too far for small boats. Besides, with catch share management in effect since 2010, sector rights are being purchased like real estate by larger fishing fleets. “The Canadians did a better job of managing the fisheries before we did. They put serious restrictions in place. The industry didn’t suffer because they have unemployment benefits for their fishermen. Here, they are just out of luck,” says Pettigrew. Pettigrew now supplies his fish market by buying a wide variety of fish from the fish auctions in Boston. Product can be from just about anywhere — Hawaii via air or Georges Bank with big trip boats. Fish graders are onsite, and Pettigrew bids and buys via computer. A trucking company brings the purchases up to Portsmouth. In the last few years, researchers at UNH have been working to develop new tools for fishermen — namely, to make them farmers of the sea. With help from NH Sea Grant and federal grants, UNH personnel built cages and stocked out seedling steelhead trout from Sumner Brook Fish Farm in Ossipee. Now, about seven fishermen, with several father-and-son teams, are able to dabble in aquaculture as they continue to fish, according to Michael D. Chambers, Ph.D., aquaculture specialist at UNH in Durham. 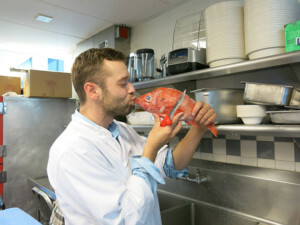 “We are trying to make fishermen aware of alternate fisheries that can be farmed,” he says. It has become a promising business opportunity over the past three years. The fishermen are responsible for buying the seedlings and feeding the trout during their growing season from May through December. According to Chambers, the fishermen have found markets for their fish and roe. All the trout in the pens are female, so there is little worry if they escape. Chambers ensures that the fish feed is the best available and maybe more nutritious than what a wild fish might be able to forage on any given day. The fishermen tend to the cages as they head to and from their lobster grounds. Aquaculture helps diversify their skill sets and supplements their income. Full-service fish market with lobster pound. All kinds of fried seafood available for take-out or in the restaurant. UNH aquaculture specialists have added another dimension to the trout farming experiment. The pen perimeters are strung with sugar kelp, the kind you occasionally have peeled off your skin at Hampton Beach. Turns out it is very nutritious and packed with vitamins and minerals. In addition, there is a symbiotic relationship between the fish and the kelp. The kelp uses the micro nutrients excreted by the fish and in effect cleans the water. Ocean Approved, a Maine operation, processes kelp and has found a market for kelp slaws and rounds. As their marketing materials say, “Kelp has more calcium than milk, more iron than spinach and more fiber than brown rice. You can’t go wrong with kelp!” Their product is used in salads at the Flatbread Company, headquartered in Maine. Chef Evan Mallett of Black Trumpet in Portsmouth has also experimented with kelp. Meanwhile, Chef Evan Hennessey of Stages at One Washington goes out and pulls his own seaweed for smoothies, chips and his creative experiments. Seaweed is also a viable commodity used in cosmetics and ice cream. Nori, the more familiar seaweed used at Japanese restaurants, is also under study at the UNH labs by Dr. Chris Neefus, professor of biological sciences at UNH. Nori grows in summer and would extend the season for the sugar kelp growers and supply an established market demand. Rich Pettigrew says lobster stocks are high and so are the prices that lobstermen have been getting. It’s a viable business at the moment and harvest totals for lobster and cod have flip-flopped over the past couple of years to where most of the harvest in New Hampshire waters is now lobster. Landings of 3,830,079 pounds were reported in 2013, a value of $16.6 million, and 2014 was reportedly even higher. That said, there is much contention out on the waters with veteran lobstermen and new lobstermen sinking lobster traps on the sea floor. It’s just too easy to steal or sabotage a competitor’s harvest. 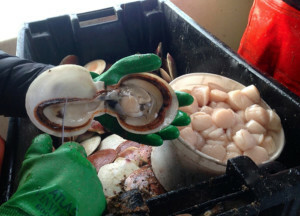 Mussels are being produced off the NH shores and oysters are being farmed in Great Bay. State permitting changes in 2010 allowed the oyster industry to jump from one to 15 farms, says Chambers. Currently, there are four individuals harvesting oysters in the brackish waters of Great Bay as it takes three years to bring an oyster to a harvestable size of three inches. As a filter feeder, oysters are one way to help clean the water of excess nutrients created by environmental impact and local chefs are happy to have them. Louis puts his menu where his mouth is. “I pride myself in not serving salmon or tuna or shrimp from far-off lands,” he says. “They are great tasting seafood, but I look to products from our own waters. With 10,000 diners on a Saturday night in this town, local fish offerings could make an impact and could shift the momentum.” Louis also worked with Spencer Montgomery’s grant program that brought Acadian redfish seafood from nearby waters to Dover high school students. “I was really impressed with the students’ response,” he says. NH Community Seafood is bringing local fish to households from Portsmouth to Concord via the Consumer Supported Fishery (CSF) model. The concept is simple. Individuals order the amount of fish they want weekly from 1/4 lb. and up, and they pick it up at designated spots throughout southern NH. It’s fisherman’s choice — anything from monkfish to dogfish to cod that was possibly caught that morning. It’s a great model where the fishermen are given a fair price, but volunteer help is involved. At the same time they are promoting a Restaurant Supported Fishery (RSF) for restaurants where fish will be delivered twice a week for a contract period of 12 or 24 weeks. Choices will be seasonal and delivered filleted. Best part — restaurants will be able to display the New Hampshire Seafood Fresh and Local decal. Look for more information and a possible May start date at nhcommunityseafood.com. Explore! Many other options exist. Try Hampton Beach. Slow Fish is an aquatic offshoot of the Slow Food movement that encourages sustainable farm-to-table processes. Slow Fish board member and advocate Spencer C. Montgomery is very active in promoting the local fishing industry. He has helped students at UNH organize workshops that brought together local fishermen and local chefs to share knowledge of under-utilized species from fishing boat to dinner plate. Montgomery says, “More institutions like schools and hospitals are getting on board the local fish movement.” One of his projects involved getting eight area high schools involved with redfish, a local seasonal fish. He says the demand is there, but the infrastructure is still lacking. Most fish are still brought to markets in Gloucester and Boston. He served as national coordinator for the Slow Food Youth Network until last year, but “fish is my passion,” says Montgomery. Indeed. In addition to volunteer work and grant projects, he is a part-time fisherman himself, working on a hook fishing boat out of Portland, Maine. The crew pulls up fish, one at a time, using a jig, not live bait. Currently, he and local chefs are using cusk. It’s in abundance and is firmer than cod. “It just happens to look a little bit like an eel, and that turns people off,” he says. Their fish permit is through a Common Pool license and they market their hauls directly to retail centers and restaurants. It’s a model that can be profitable for some fishermen. From fishing boat to research lab to regulatory office to restaurant kitchen, there’s a cautious optimism that our abundance of lobsters and scallops will be complemented by a brave new world of fish diversity. But much depends on the consumers’ willingness to open their mouths and say yes to local, yes to something new — even yes to dogfish. So spread the word, and pass the tartar sauce. Located in the former Zahtar Mediterranean Sandwich Bar space, the new The Franklin Oyster House was named as an ode to its location in the Franklin Block in Portsmouth. 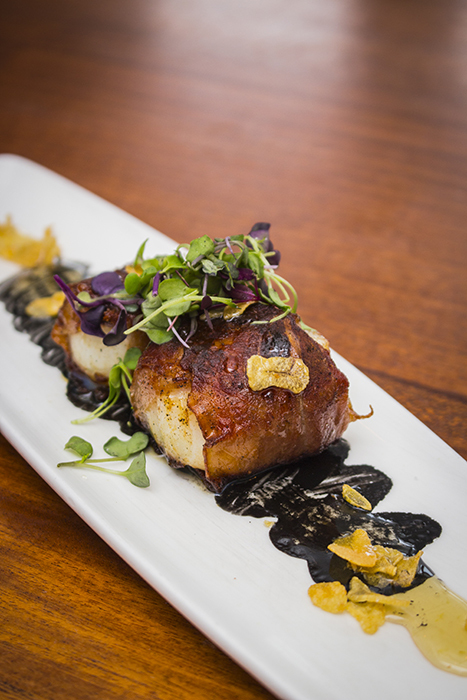 It is a cooperative effort between Chef Matt Louis and Seacoast restaurateur Jay McSharry. They will showcase what is and has been important to them — seafood and local offerings. Looking back, they discovered an old menu from the Franklin House Restaurant in 1867 at the Portsmouth Athenaeum. The Valentine’s Day menu offered three uses of oysters. That also kind of helped set the direction for this new restaurant in a space that has, curiously, always been a restaurant. Before Zahtar, it was the original Café Mediterranean spot. The new menu will be oyster forward, says Louis. The beverage list, including beer, wine and the cocktail program, will be geared to oysters. “We will pay attention to ingredients in our craft cocktails with house-made infusions and bitters.” The menu will be the reverse of what Jumpin’ Jay’s has to offer. Not a large fish menu, but a diverse selection of seasonal oysters, including Cedar Points, Fat Dogs from Goat Island and others from local waters in Maine, Rhode Island and Massachusetts. A few will be included from the Pacific as a counterpoint. Fish entrées and other dishes will be designed to complement the oyster selections. The roundabout on Rte. 1A in Rye, Foyes Corner, is now anchored with a full-service restaurant called Atlantic Grill. The beautiful space offers a large bar, high-top tables in front of huge windows and comfortable dining all around. The new construction also offers flexible function room space and this summer their huge deck will be the place to be. 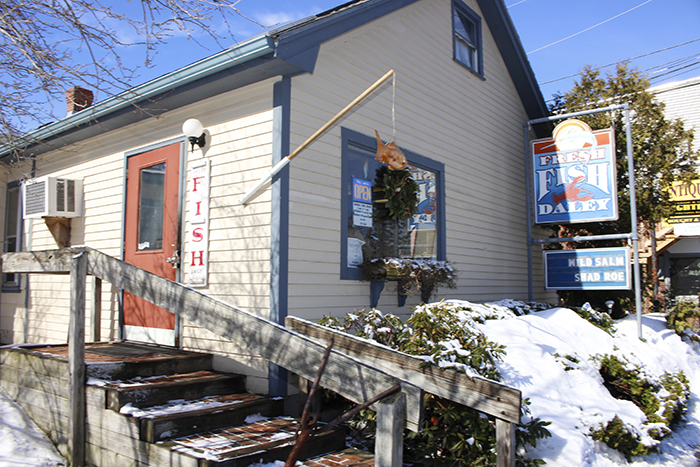 Owners Michael and Peter Labrie also own River House on Bow Street in Portsmouth. They have brought in their award-winning seafood chowder (People’s Choice at the Portsmouth Chowder Festival) and chef from that location. The seafood menu is supplanted with fresh oyster selections, a lofty seafood tower of raw bar offerings and interesting salads. Entrées range from a classic broiled haddock to a seafood saffron with lobster, scallops, clams and shrimp in a saffron tomato fumet (pictured at right – photo by Susan Laughlin). Land lovers can be pleased that sandwiches and additional casual fare are available too. Chef Boucher’s cooking school caterers to professionals with intensive training and home chefs wanting to stretch their skills and learn new ideas for entertaining. Boucher also teaches hospitality students at UNH. 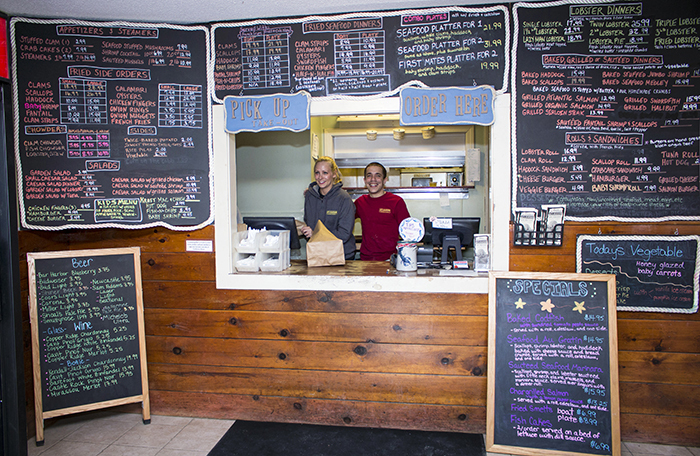 Savory Square Bistro, partly staffed by students, is open six nights a week, starting at 4:30 p.m. Monday through Saturday. The restaurant recently opened for lunch Wednesday, Thursday and Friday from 11:30 a.m. to 4 p.m. If there is a secret to preparing seafood, it’s “don’t overcook it,” says Chef Boucher. Prepare the sauce: Combine the oil, lemon juice, parsley and salt in a blender. Process until the parsley is puréed. Set aside. Sear the fish: Coat the fish fillets evenly with a light sprinkling of crushed peppercorns and sprinkle with salt. Heat the olive oil in a cast iron skillet to just below the smoking point. Place the fish fillets in the hot pan presentation side down. Sear the fish until well browned but do not overcook. Turn the fillets over and finish the cooking. To plate: Place a 3-ounce portion of potatoes in the center of each plate. Top the potatoes with a single portion the seared fish. Place the carrots strategically around the plate. Drizzle each plate with about 3/4 ounce of the parsley sauce in a circle around the fish.